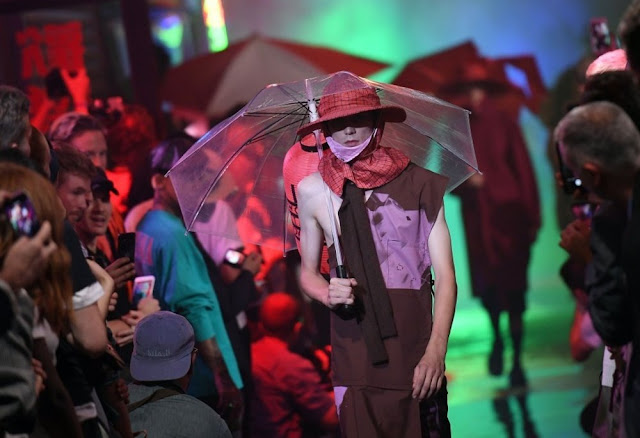 Prior to his arrival Raf Simons was the show to be seen at New York Fashion Week: Men’s. Comparatively, NYFW:M has had difficulty taking off in the same way as London Fashion Week Men’s did five years ago. The week feels shorter, with less designers on schedule. (Other than Simons there aren’t many interesting names save for Rochambeau, Bode, Palomo Spain and Matthew Adams Dolan.) His Fall 2017 menswear show for his namesake label was about his adopted home, where he arrived last July to take on the position of Chief Creative Officer at Calvin Klein. While the first collection was based on a more idealised vision of New York, the second season at NYFW:M was informed by his experience of having been in the city for a year, settling in and channelling the spirit of the city into something. New York itself, as an entity, inspired Simons. In his first month of living there he got to know the city. He was influenced by the incongruity of architecture styles, good taste and bad taste, high culture and low culture. “For me it’s full on Blade Runner. Very hard contrasts between the sophisticated and the trash, the high and the low living alongside each other on the same street,” he told his friend and editor Ashley Heath, in the latest issue of Pop magazine. “In New York I have the Blade Runner feeling… and I love it.” Consequently, there was an air of Blade Runner that permeated the scene. Underneath the Manhattan Bridge, with trains rattling overhead, there were hanging Chinese lanterns, an array of neon lights illuminating puddles on the makeshift runway. Simons strived to punctuate this with filmic energy, hence the Blade Runner references. The word ‘Replicant’ was projected here and there, around the show space. It is a reference to the film’s bioengineered androids. The word was printed on shirts too. Did this whole collection foreshadow the future? 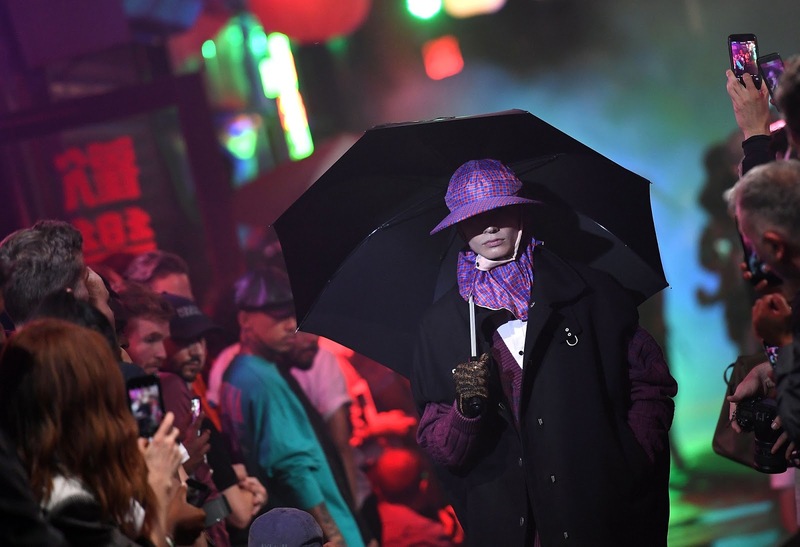 The models carried umbrellas, but preemptively—the rain had yet to fall. Will the human race evolve into bioengineered robots, with the enhancement of artificial intelligence and technological developments? The bleakness of it all characterises Simons’ work of late, it has been sinister and driven by doom. If anyone has a visual language as extensive and detailed as Raf Simons I don’t know who it is. He frequently collaborates with graphic designer Peter Saville who worked on this show. He was responsible for the Joy Division references in Simons’ oeuvre in the early 2000s. Here, Simons repurposed his graphics on the compilation album Substance on umbrellas; New Order’s Substance 1987 on lanterns and t-shirts; layering prints from Unknown Pleasures by Joy Division, a black and white contoured piece, and pink roses from Power Corruption Lies by New Order. Other albums Technique and Movement featured also. One recalled the Spring 2017 collection when he collaborated with the Robert Mapplethorpe Foundation on a selection of printed garments. This work is distinctively memorable for it references the most famous post-punk bands of the 1980s. His visual language doesn’t stretch as far as the graphics he uses but to the shape and cut of his clothing. The ‘picture frame’ tops from Spring 2017, the slouchy oversized jumpers from Fall 2016.